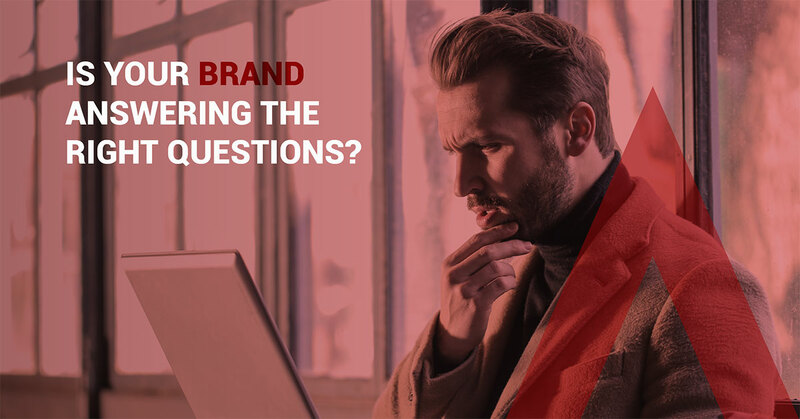 10 Apr Is your brand answering the right questions? Companies spend good money on their websites, sales packs, brochures, social media and sales pitches but are often puzzled about why they’re not getting the results that they need. Tell me something I don’t know (but need to know). You could be spending your entire marketing budget telling people what’s important to you without truly understanding how you make the world a better place for your target audience. Most companies only talk about the features of their intrinsic product. For intelligent people, that’s like “tell me something I don’t know”. What does your brand say about your target audience? What does Nike mean to certain people? Who can tell me what the specifications of a Nike running shoe are? What does shopping at the Body Shop say about some people? Don’t fall into the trap of thinking you’re too small to think like the big brands. Rise above the competition. You sell a widget and the features are the same or similar to that of other widget companies. So all of you are saying the same things in the same places and it then comes down to price. Have you considered that your customers are more interested in your fulfillment process? How easy or difficult is it to do business with you? How do you recognise that your customers are time-pressured, stressed and increasingly cynical in an era where indifferent service is the norm? Would they pay a bit more for the reverse of the bad norm? Many would, many wouldn’t. But you need to let the ‘many would’ tribe know of your existence. One way to arrive at an answer is to ask ‘why’. A big feature is that the soul of the shoe is 10 cm thick. It lasts longer on tough terrain. And by the way, it makes one appear taller. Let’s make an advert of Tom Cruise jogging through Kyrgyzstan. The above illustration is tongue-in-cheek but it does provide a sense of where we’re going with this. Does your Website homepage have a pic of a running shoe screaming NEW 10CM SOUL! Or does it open to a video of Tom running Kyrgyzstan? Maybe with a strap line of “Don’t hold back”. More powerful?! Does it connect? Sure it does! It’s not just Kyrgyzstan joggers that will buy it – there are more 4X4’s in Sandton than there are in Namibia. Before you spend time and money presenting your company out there, spend some time figuring out your brand strategy. Your brand strategy will give your agency the opportunity to create some magic, position you beyond your competitors and connect with the audience that is looking for you. Everything else that you do from then will reinforce your position and take you closer to people looking for what you have to offer. You’ll now be investing money, not spending money. Contact Sherpa CEO Gary Hendrickse for help in shaping your brand strategy.